Beautiful cottage with breathtaking view of Lake Ossipee (the main lake) and panoramic view of the mountain range right outside your window. Rental of cottage also includes use of private beach, dock and mooring....bring your boat or jet ski! 18 hole public golf course, Indian Mound, very close by! A great getaway from all the hustle and bustle of everyday life! Come enjoy a little slice of heaven! Make sure to contact about this rental ASAP as the summer weeks book very quickly! Many renters return year after year, you won't be disappointed. 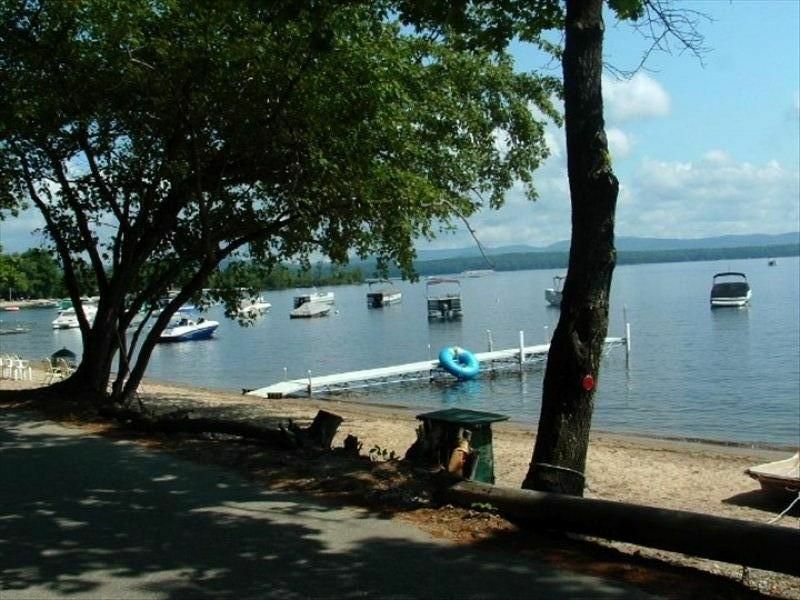 Our family has has enjoyed this property for many years on Lake Ossipee, NH. We are child and pet friendly and want folks to have a great vacation. Many folks return year after year and become part of our own extended family. We have enjoyed the sunsets and full moons over this lake for many years. Come and enjoy our home! This property has 200 feet of private beach, a boat mooring and a dock. It sits at the base of the White Mountains and is close to restaurants, golf course, shopping and entertainment. The house is clean and neat and sleeps 6 people comfortably. It also has a 3 season porch, a deck and a gas grill (clean) for cooking. Private beach, dock and boat mooring. 15 miles from North Conway, close to Weirs Beach and other entertainment for the family. Boat trailers ok to park on property. We rented this property last minute (the day before the rental began) because our initial lake rental property fell through just days before due to a bacterial infestation in the water making it unusable. This property was the only one we found that would also allow a dog. Given that it was still available the day before the rental began, we should've been concerned, but we were desperate to make the best of our vacation. We arrived around 8:00 pm on the Saturday check-in date and were very disappointed. The property had a very strong foul odor to it and was not clean. There was hair (human and animal) on the couches. There were cobwebs and also dirt/sand on the bedspreads. Needless to say, we left the next morning and spoke to the owners (Gene and Carol) before departing. We told them that the property was much more "rustic" than we had anticipated and we requested a refund of 50%. Gene confirmed that he would send us a refund by check as he said he didn't know how to credit our credit card. We contacted the owners by email a week after the rental end date requesting an update on the refund and never received a reply. We then received a refund for the "cleaning fee". We then contacted VRBO directly and spoke with a representative about our concerns. She said that she would contact the owners for a refund. We still have not received a reply from the owners or a refund. This was a great Lakehouse. Everything was as described, and the unit was very clean. We had a great experience at this house. Right on the Lake. Water is shallow far from the shore. My 8 year old swam with no worries. Great for kids. The shore is well maintained with sand, and you can have a good beach like setup there. The views from this house/beach were amazing. Mountains, and sunrise/fall will put you at ease. Pet friendly option a huge plus. Again unit was very clean. Wouldn’t think pets had been there. The owner met us on arrival, and gave us the lay of the land. Great people. A pleasure to speak to. We would not hesitate to rent again. We enjoyed our week in this quaint cabin on Lake Ossipee. The cottage was clean and the kitchen was well equipped. We have stayed in many cottages over the years and this one had a great variety of dishes and pots and pans. We cook almost all of our meals while we are at the lake and besides some counter space there was nothing lacking. We had brought a small folding table which came in handy for extra space. The stairs up to the two upstairs bedrooms are steep but were okay for one week. The water pressure in the shower was good and there was plenty of hot water. All in all a great week - lots of private beachfront, a nice dock for our rental boat, good location in a cove close to shopping and a quiet road to take walks on along the lake. The owners were there to greet us both upon arrival and departure and were friendly and helpful. My family and I recently returned from a week's stay at this pleasant cottage. This home has been in the owners' family for generations and that is exactly the vibe of the place. It is charmingly rustic and somewhat quirky with a mix of furnishings from antiques to 80's castoffs. That being said, the house was clean and well appointed with comfortable beds (two bedrooms upstairs and one down) and sufficient pots, dishes, flatware, etc. The kitchen has a newer fridge and stove but was a little short on counter space. The view out the living room and sun porch windows was beautiful and the beachfront clean, sandy and private. Our two kids (11 and 14) and they were thrilled with clean shallow water and many coves, sandbars and inlets on Ossipee Lake and stayed out for hours on their kayaks swimming and exploring. The house is in a very family friendly, safe and quiet community with many long term summer residents and a sprinkling of renters. It was great to let my kids have freedom to explore on their own. My husband loved the fishing and I loved the proximity to N. Conway and some great White Mtns hiking. My dogs were happy being walking along the street and meeting and greeting the many neighborhood pups. The owners were onsite, friendly, kind and gracious, allowing our kids to use their peddle boat and other beach toys and to store their bikes in their shed. In all this was a vacation house that will definitely go on our rotation. We are planning to book a week next year and look forward to another fun and relaxing week. Perfect for family with kids/young teens! My husband and I had recently lost our Yellow Lab of 8 years and wanted to getaway and show our 4-year old Golden Retriever that life will still be fun without his companion. We arrived with our boat in tow and the fun never stopped the entire weekend. The location was perfect with hardly any boat traffic except for those staying in the area. Easy access to Route 16 for shopping and dining out. The owners of the property were very accomodating and inviting. Our families live in Freedom and Wakefield during the summer and we had the perfect meeting place for everyone to enjoy. We are booked for the week after the 4th and cannot wait to return. Special thanks to the oweners for making our getaway PERFECT!! Close by Weirs Beach with water slides, restaurants and beach. Santa's Village in Jaffrey and Story Land not too far. Ideal location for kids. Bring their bikes great riding. Also close to the Barnstormers Summer Theatre - live plays.